Alzheimer’s disease (AD) is the most common cause of dementia among the elderly. To clarify pathogenesis of AD, thousands of reports have been accumulating. However, knowledge of signaling pathways in the field of AD has not been compiled as a database before. 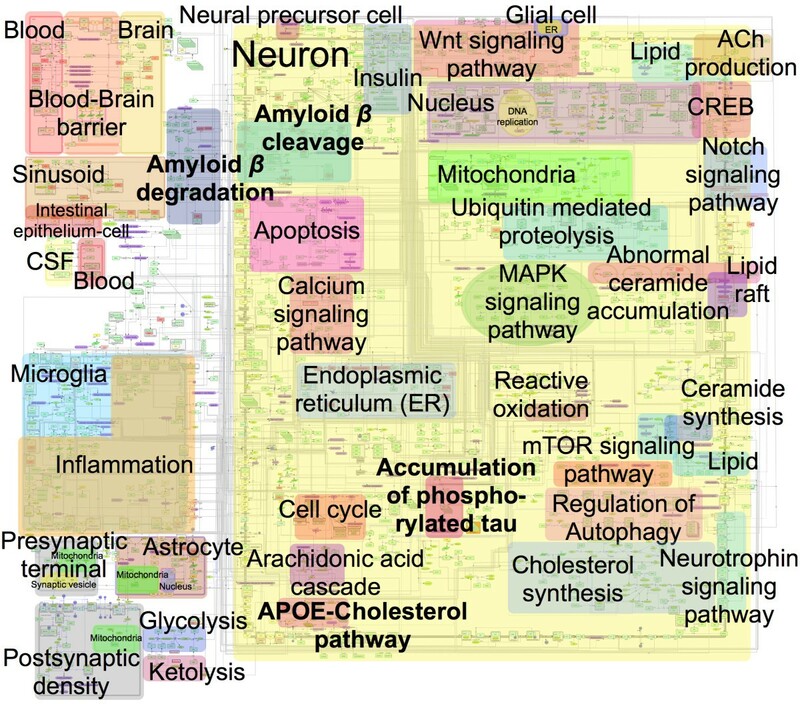 Here, we have constructed a publicly available pathway map called “AlzPathway” that comprehensively catalogs signaling pathways in the field of AD. We have collected and manually curated over 100 review articles related to AD, and have built an AD pathway map using CellDesigner. AlzPathway is currently composed of 1347 molecules and 1070 reactions in neuron, brain blood barrier, presynaptic, postsynaptic, astrocyte, and microglial cells and their cellular localizations. AlzPathway is available as both the SBML (Systems Biology Markup Language) map for CellDesigner and the high resolution image map. AlzPathway is also available as a web service (online map) based on Payao system, a community-based, collaborative web service platform for pathway model curation, enabling continuous updates by AD researchers. AlzPathway is the first comprehensive map of intra, inter and extra cellular AD signaling pathways which can enable mechanistic deciphering of AD pathogenesis. The AlzPathway map is accessible at http://alzpathway.org/. Alzheimer’s disease (AD) is the most common cause of dementia among the elderly. With the advent of the aging society, 24.3 million people are estimated to suffer dementia worldwide, increasing to 42.3 million people by 2020 and 81.1 million by 2040 [1, 2]. The total estimated worldwide costs of dementia are US$604 billion in 2010, and are estimated to increase by 85% to 2030 . The cost for caring for the increasing number of people with dementia will rise dramatically and thus will be disastrous burden to our societies within upcoming 10–20 years. To address this social issue, clarification of the pathogenic mechanism of AD and development of AD drugs are urgently expected. Genetic association with putative AD susceptibility genes has been studied and collected as a publicly available database called AlzGene (http://www.alzgene.org/) . Pathological signaling has been also studied and two core pathological hallmarks of AD, amyloid plaques and neurofibrillary tangles (NFT) accumulation, have been elucidated intensively. However, wealth of this information has become increasingly difficult to follow, much less interpret, and has not been integrated before. Integration of pathway knowledge bridging amyloid plaques and neurofibrillary tangles has been still missing. Efforts to construct an AD pathway map have been made before, however, these maps are overviews or partial maps of an AD pathway, and are not comprehensive maps. Manual elaboration is still required to construct a comprehensive and accurate map of a particular signaling pathway . Efforts to manually construct pathway maps of particular signaling, e.g., Toll-like receptor, EGFR, RB/E2F, mTOR signalings, and dendritic cell signaling in response to pathogenes, have been made before [6–10]. In this study, we collected and manually curated over 100 review articles involving in AD, and built an AD pathway map using CellDesigner , a modeling editor for biochemical pathways. AlzPathway is the first comprehensive map of intra, inter and extra cellular signaling pathways of particular disease. AlzPathway now contains 34 canonical pathways such as APP, mitochondrial and apoptosis pathways, which are composed of 1347 species (proteins, complexes, simple moecules, genes, RNAs, ions, degraded products, and phenotypes), 1070 reactions, 129 phenotypes in neuron, brain blood barrier, presynaptic, postsynaptic, astrocyte, and microglial cells and their cellular localizations. Our AlzPathway provides a powerful AD pathway map for deciphering pathogenesis of AD, and it serves as a pathway reference database just as AlzGene for risk-gene reference database. AlzPathway allows us to not only evaluate candidate risk genes listed by GWAS studies, but also analyze omics data including DNA microarray data and RNA-seq data to reveal pathogenesis of AD. Our pathway map will be an indispensable basic resource for both clarification of the pathogenic mechanism of AD and development of AD drug to address social issues caused by AD. We collected 123 review articles related to AD accessible from PubMed. We then manually curated these review articles, and have built an AD pathway map by using CellDesigner. In PubMed, the number of research articles involved in Alzheimer’s disease is over 80,000. In fact, we cannot collect and manually curate over 80,000 research articles. To construct AlzPathway, we need to choose articles among over 80,000 research articles. Review articles are attempts to chose important articles and summarize current state of understanding on signaling pathways involved in Alzheimer’s disease. Therefore, we chose to use review articles for the curation. 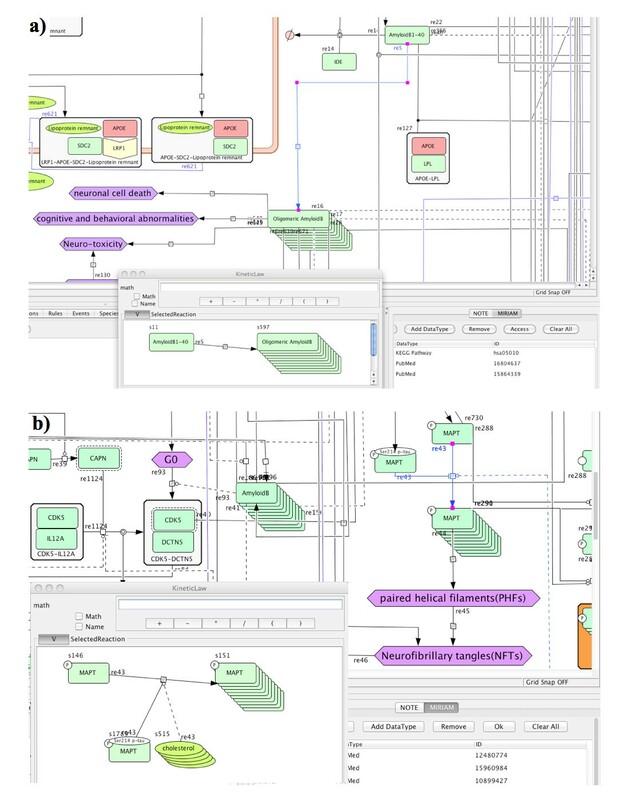 Notations are based on the PD (Process Description) of SBGN (Systems Biology Graphical Notation)  and the map is available in standardized SBML (Systems Biology Markup Language)  format for file exchange between different tools. Molecules are distinguished by the following types: proteins, complexes, simple molecules, genes, RNAs, ions, degraded products, and phenotypes. Gene symbols are pursuant to the HGNC symbols. Reactions are also distinguished by the following categories: state transition, transcription, translation, heterodimer association, dissociation, transport, unknown transition, and omitted transition. All the reactions have evidences to the references in PubMed ID using the MIRIAM scheme . All the references used for constructing the AlzPathway are listed in the ‘References for AlzPathway’. Cellular types are distinguished by the followings: neuron, astrocyte, and microglial cells. Cellular compartments are also distinguished by the followings: brain blood barrier, presynaptic, postsynaptic, and their inner cellular localizations. AlzPathway is available as both the SBML map for CellDesigner ( Additional file 1; see the section of Additional files) and the high resolution image map ( Additional file 2; see the section of Additional files). 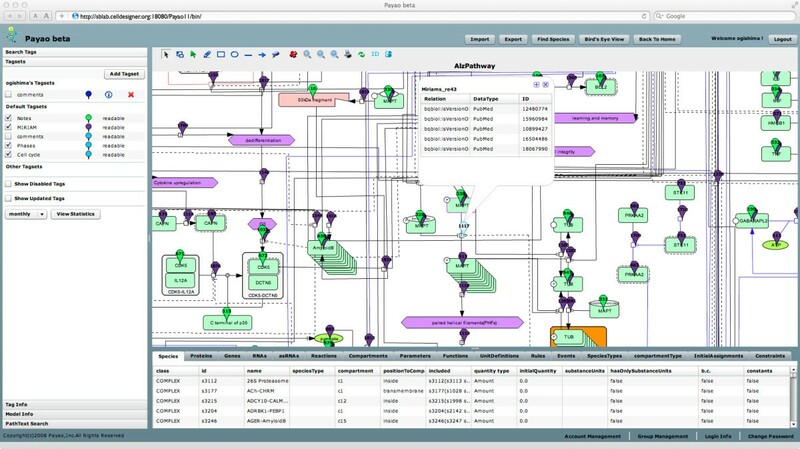 AlzPathway is also available as the web service (online map) implemented by using Payao , a community-based, collaborative web service platform for gene-regulatory and biochemical pathway model curation, enabling continuous updates by AD researchers. Payao web service (online map) is accessible from http://alzpathway.org/. Instruction on how to access the AlzPathway web service (online map) is described in the Additional documentation file ( Additional file 3; see the section of Additional files). Using the Payao system would enable AD researchers not only to browse reactions and their references in PubMed ID but also to comment, correct and update AlzPathway in a community-wide collaboration. 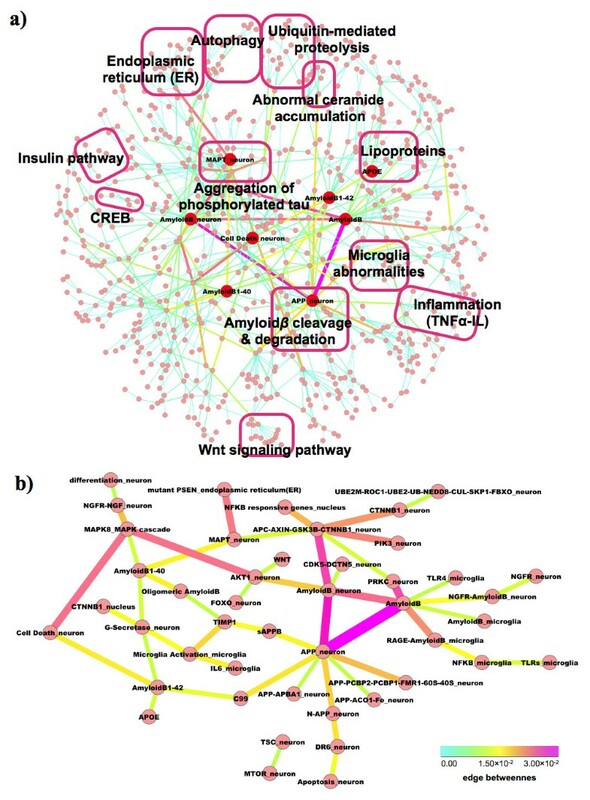 Here, we present a map of Alzheimer’s disease signaling networks (Figure 1). We manually constructed a map of Alzheimer’s disease signaling networks by assembling molecular interactions based on published papers using the modeling software, CellDesigner ver. 4.2 (http://celldesigner.org/). Overview of AlzPathway overlaid with canonical pathway annotations for explanation of map. AlzPathway consists of 1347 molecules, 1070 reactions, and 129 phenotypes. 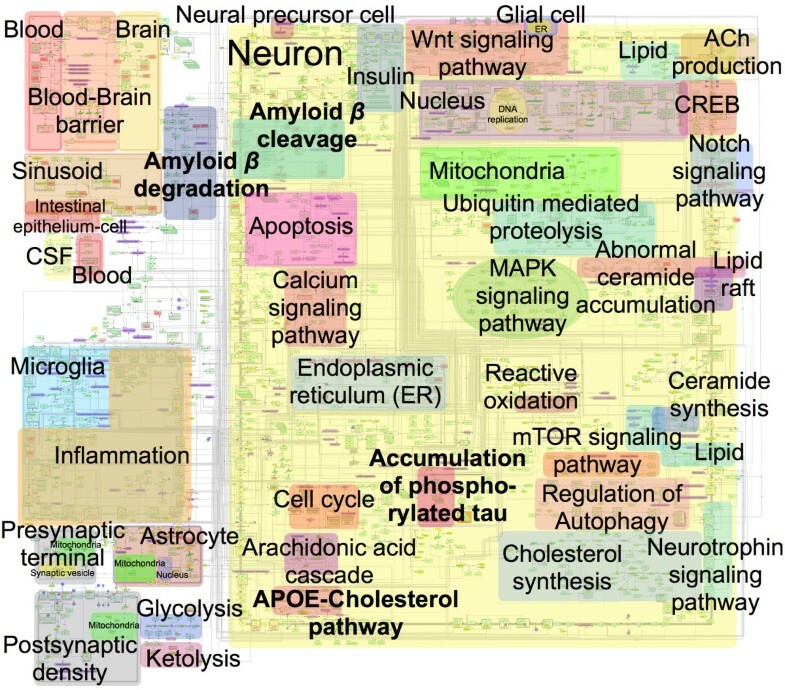 Original and high resolution version of AlzPathway is available at http://alzpathway.org/ as both the SBML (Systems Biology Markup Language) map for CellDesigner and the high resolution image map without overlay of canonical pathway annotation. AlzPathway is also available as the web service (online map) implemented by using Payao system. The AlzPathway map consists of 1347 species, 1070 reactions, and 129 phenotypes. The molecues shown on the AlzPathway can be categorized as follows: 650 proteins, 232 complexes, 223 simple molecules, 32 genes, 36 RNAs, 24 ions, and 21 degraded products. The breakdown of reactions is as follows: 401 state transitions, 22 transcriptions, 30 translations, 172 heterodimer associations, 49 dissociations, 87 transports, 20 unknown transitions, and 228 omitted transitions. All the 123 references used for constructing the map are listed in the ‘References for AlzPathway’ [16–138]. The CellDesigner software allows the user to access references that are used as evidences for individual reaction using PubMed ID (Figure 2). Detailed view of AlzPathway. (a) oligomeric amyloid β formation, (b) MAPT phosphorylation. Notations are based on SBGN (Systems Biology Graphical Notation). References to the reactions are represented in PubMed ID (PMID) using the MIRIAM scheme. 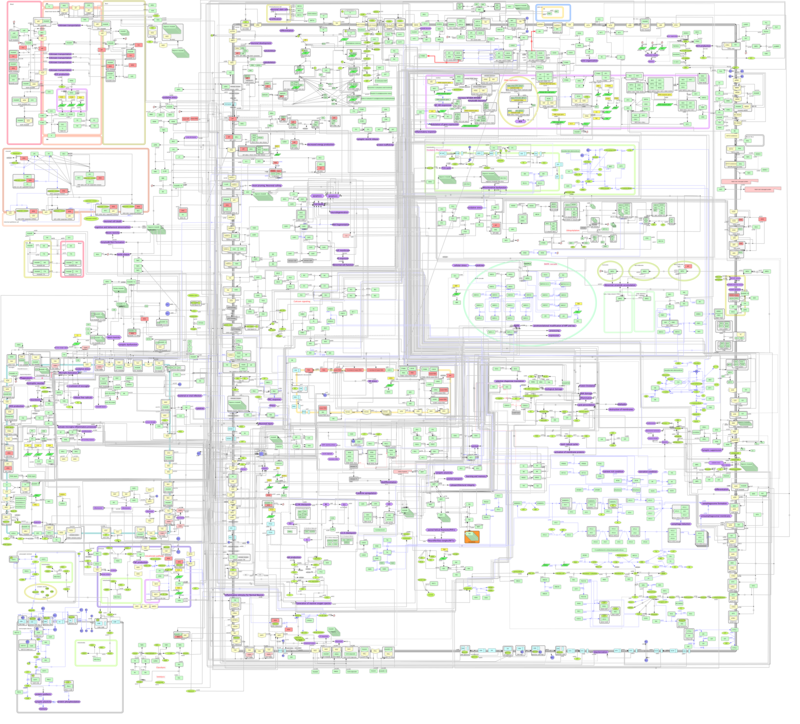 The map consists of the AD hallmark pathways and canonical pathways. The AD hallmark pathways are amyloid β cleavage, amyloid β degradation, APOE-cholesterol pathway and NFT accumulation, which are major pathological pathways of AD. On the other hand, the canonical pathways are acetylcholine production, cholesterol synthesis, Wnt signaling pathway, Notch signaling pathway, Ubiquitin mediated proteolysis, apoptosis, calcium signaling pathway, ER stress, MAPK signaling pathway, abnormal ceramide accumulation, ceramide synthesis, reactive oxidation process, regulation of Autophagy, neurotrophin signaling pathway, cell cycle, arachidonic acid cascade, mTOR signaling pathway, lipid pathway, lipid raft, inflammation pathway, insulin pathway, and CREB pathway. AlzPathway is the first comprehensive map of intra, inter and extra cellular signaling pathways of particular disease manually constructed. Manual reconstructions of comprehensive map have been reported before: epidermal growth factor receptor signaling, toll-like receptor signaling network, RB/E2F signaling pathway and mTOR signaling pathways [6–9], which are molecular signaling pathways and are not comprehensive intra, inter and extra cellular signaling pathways of particular disease. That is, AlzPathway comprehensively catalogs not only intra but also inter and extracellular signaling pathways among neuron, glial cell, microglia, presynaptic cell, postsynaptic cell, astrocyte, and blood–brain barrier. The brain and spinal cord are made up of various regions and cells, including neurons and glial cells. To reveal pathogenic mechanism of AD, complicated signaling pathways among neuron, glial cell, microglia, presynaptic cell, postsynaptic cell, astrocyte, and blood–brain barrier should be clarified. As for intuitively understandable notation of AlzPathway, we also constructed AlzPathway not only in SBGN (Systems Biology Graphical Notation) PD (Process Description) notation but also in binary-relation notation (Figure 3(a)). In SBGN PD notation, a reaction consists of reactants, modifiers, and products. We converted this notation to binary-relation notation by decomposing reactions into those between (1) reactants and products, and (2) modifiers and products. Molecules are limited to proteins, complexes, genes, RNAs and phenotype for simplification. SBGN PD notation is precise notation for describing pathways, on the other hand the binary-relation based conventional notation used by molecular biologists in the current literature, is intuitively understandable. To clarifying basic structure of AlzPathway, we constructed AlzPathway in binary-relation notation, and found that amyloid β accumulation and hyperphosphorylated tau accumulation are central pathogenesis signaling pathways in AlzPathway. Binary-relation notation is provided as a SIF (simple interaction format) file ( Additional file 4) which can be opened by using Cytoscape . Binary-relation notation and key molecules of AlzPathway. (a) overview of AlzPathway in binary-relation notation, (b) top 50 high centrality relations as highlighted primary pathway of AlzPathway. According to edge betweenness centrality of each reaction, high centrality relations were highlighted as primary relations. Top 50 high centrality relations are shown in Figure 3(b). Highlighted binary relations were so-called AD hallmark pathways: amyloid plagues (amyloid β accumulation) and NFT accumulation (hyperphosphorylated tau accumulation). The γ-secretase produces amyloid β 1–40, which leads to oligomeric amyloid β (amyloid β accumulation). Amyloid β 1–42 is related to cell death, which is amyloid plagues (amyloid β accumulation) and NFT accumulation crucial for AD progression. On the other hand, APC-AXIN-GSK3B-CTNNB1 complex phosphorylates MAPT and mutant PSEN promotes phosphorylation of MAPT, which lead to MAPT hyperphosphorylation and NFT accumulation. The AlzPathway map is accessible at http://alzpathway.org/. As described above, AlzPathway is provided as (1) the SBML map for CellDesigner ( Additional file 1), (2) the web service (online map) implemented by using Payao accessible from http://alzpathway.org/ (see the Additional file 3 for instruction on how to access the AlzPathway online map by Payao), (3) the high resolution image map ( Additional file 2), (4) the binary-relation notation ( Additional file 4), (5) the pure SBML map ( Additional file 5) for compatibility with other SMBL supporting tools, and (6) the BioPAX file for exchanges of pathway data ( Additional file 6). For Notations are based on the PD (Process Description) of SBGN (Systems Biology Graphical Notation). The CellDesigner software and Payao system allow the user to access references that are used as evidences for individual reaction in PubMed ID using the MIRIAM scheme. They also allow the user to access external resources including UniProt and PubChem for individual species using the MIRIAM scheme. AlzGene information is provided for individual species using Notes. Expanded version of AlzPathway map having external links to Gene Ontology is also provided ( Additional file 7). As for usage of CellDesigner software, see the documentations provided at CellDesigner web site. As for usage of Payao system, see the user’s guide provided at Payao web site. We constructed AlzPathway to be comprehensive but not necessarily to be complete. While continuous curation of molecular pathways remain a major challenge, the availability of Alzpathway through Payao (http://alzpathway.org/) would enable AD researchers to review, comment and provide feedbacks to the pathway through the web-based interface (Figure 4). Correction and update of AlzPathway can be made through comments and feedback from AD researchers in specific molecules and interactions. By using Payao system, we envision to reach out to the AD community and continuously correct and update AlzPathway. In addition to community-driven correction and update using Payao system, we will keep updating our pathway map by ourselves. AlzPathway on Payao system. Payao system provide community-based, collaborative web service (online map) platform for pathway manual curation. AlzPathway is comprehensive AD pathway map, and is expected to be a guidance map in the study of AD. Just as AlzGene for risk-gene reference database, AlzPathway serves as a pathway “reference” integrating wealth of pathway information published before. AlzPathway also serves for analysis on omics data including DNA microarray data and RNA-seq data. Availability of AD pathway map in standardized formats (SBML and SBGN) renders the network applicable to systems-biology analyses based on various SBML compliant tools. Therefore, our AD pathway map will be an indispensable basic resource for both clarification of the pathogenic mechanism of AD and development of AD drug. We constructed a publicly available database called “AlzPathway” that comprehensively catalogs signaling pathways in the field of AD. We have collected and manually curated over 100 review articles involving in AD, and have built an AD pathway map using CellDesigner. AlzPathway is the first comprehensive map of intra, inter and extra cellular signaling pathways of particular disease for deciphering pathogenesis of AD. AlzPathway is currently composed of 1347 molecules, 1070 reactions, and 129 phenotypes in neuron, brain blood barrier, presynaptic, postsynaptic, astrocyte, and microglial cells and their cellular localizations. AlzPathway is available as both the SBML (Systems Biology Markup Language) map for CellDesigner and the high resolution image map. AlzPathway is also available as the web service (online map) implemented on Payao, a community-based, collaborative web service platform for pathway model curation. The molecular level mechanistic interactions captured in AlzPathway, together with a community-driven, web based curation platform, would provide a comprehensive resource to the AD community towards deeper insights into AD pathogenesis and identification of novel therapeutic targets. The AlzPathway map is accessible at http://alzpathway.org/. The Payao system does not work on a 64 bit mode Linux. Satoshi Mizuno, Risa Iijima, Soichi Ogishima, Masataka Kikuchi contributed equally to this work. The authors are grateful for the helpful comments of an editor and anonymous referees. We thank Dr. Takeshi Fukuhara for critical discussion on AlzPathway. Funding: This work was supported by Grant-in-Aid for Scientific Research (22700311) from the Ministry of Education, Culture, Sports, Science and Technology (MEXT) of Japan. The Payao system is supported by Okinawa Institute of Science and Technology (http://www.oist.jp). SO conceived and designed the project with the help of RK and HT. SM, RI, TM, MK, and SO built the database. AM and RK reviewed the database. YM and SG implemented the web service by using Payao. SO wrote the paper with the help of YM, SG, MK, and TM. All authors read and approved the final manuscript.